S.S. #16, Gilford Public School, 1937. Margaret Canning was the teacher. 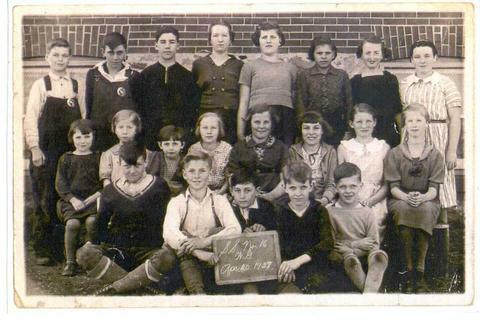 Back Row, left to right: Walter Gravestone, Jim McDonnell, Gerard Gibbons, Margaret Canning (teacher), Winnifred Neilly, Eileen Kneeshaw, Helen Porritt, Jane Bailey. Middle Row: Dorothy Bell, Marion Jackson, Joyce McDonnell, Marjorie Horsley, Betty Bedford, Norma Bell, Lillian Courtney, Ethel Todd. Front Row: Alan McDonnell, Harry Jackson, Floyd McDonnell, Sam Neilly, Bill Neilly. Note on back of photograph reads: "Frank and I were absent from this picture as we were sick with the chicken pox."